Around the world, a new year is welcomed with gifts, noise, and celebration! 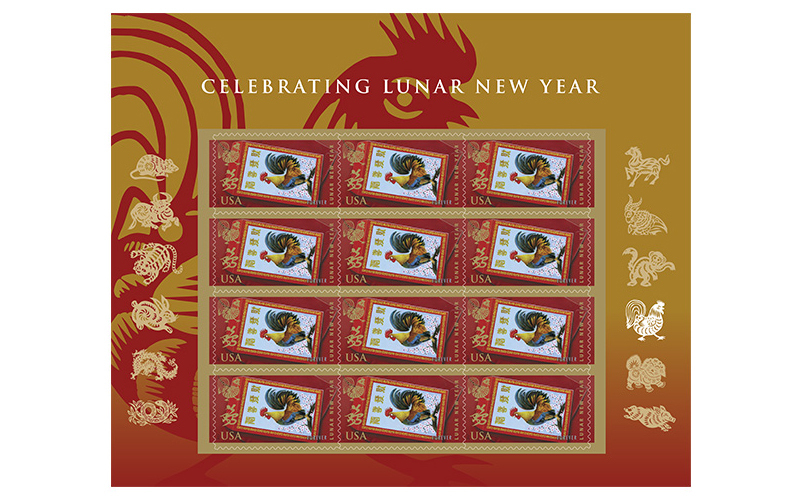 A red envelope (hongbao) featuring a colorful illustration of a rooster highlights the 2017 Lunar New Year: Year of the Rooster stamp from the U.S. 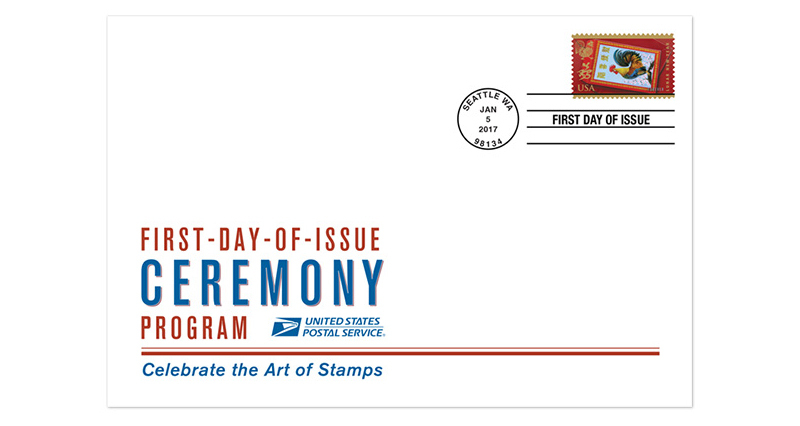 Postal Service, tenth in the Celebrating Lunar New Year series. The characters at the top of the envelope form a common Chinese greeting of celebration and wish for prosperity and good fortune, used most frequently during Lunar New Year. The Year of the Rooster begins January 28, 2017, and ends on February 15, 2018. Across many cultures, in the United States as elsewhere, the Lunar New Year is celebrated in various ways, often with parades and parties. Vendors at outdoor markets sell flowers, toys, food, and other items for celebration. Musicians play drums to celebrate this time of renewed hope for the future, with drumsticks sometimes painted red for luck. Many families present red envelopes (hongbao), like those depicted in the stamp art, containing money to children and loved ones. People eat foods that bring good luck, such as kumquats and rice cakes, and hang festive lanterns as decoration. 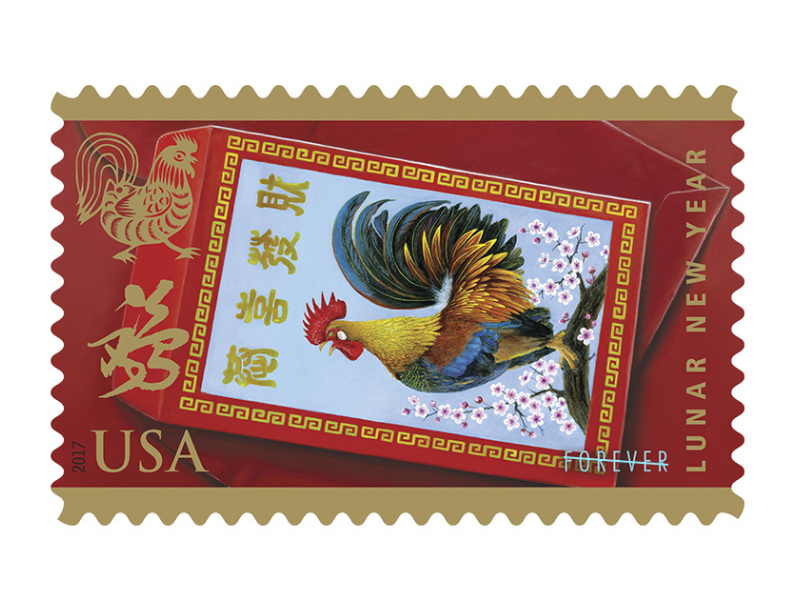 Combining original artwork by Kam Mak with two elements from the previous series of Lunar New Year stamps Clarence Lee's intricate cut-paper design of a rooster and the Chinese character for "rooster," drawn in grass-style calligraphy by Lau Bun art director Ethel Kessler has created a culturally rich stamp design that celebrates the diversity of the American experience.